My husband has been a beekeeper for over 30 years. When we were first married he took me out into the bee-yard to do some cleanup. As he removed frames and blew out some boxes, thousands of bees began to swarm around my head. I giggled. I think that was the day he decided I could stay. Phil explained that our bees didn’t sting me because I remained peaceful around the colonies and did not smell of fear. One of the first lessons I learned from the hive was maintain your peace. There is something about the hum of a bee-yard that generates a meditative response. The soothing sound of tens of thousands of God’s most industrious ecologists at work is mesmerizing and, for me, one of the fastest ways to enter a contemplative state. How does this community generate such an effect? How can we learn from them? The world of hive exists in perfect unity. Bees do not compete with one another. There is no caste system. They have a mission given them by their Creator and they take it seriously. They know their purpose and their every living moment is spent fulfilling that. There is no such thing as superiority. What would happen if we did the same? The Drones, the only males produced in the colony, have but one purpose. Theirs is to mate with the queen and die. They give their life for the continuance of the colony. Sacrifice for the greater good is important. Within the hive, each member of this community understands that the very existence of their world depends upon cooperation. 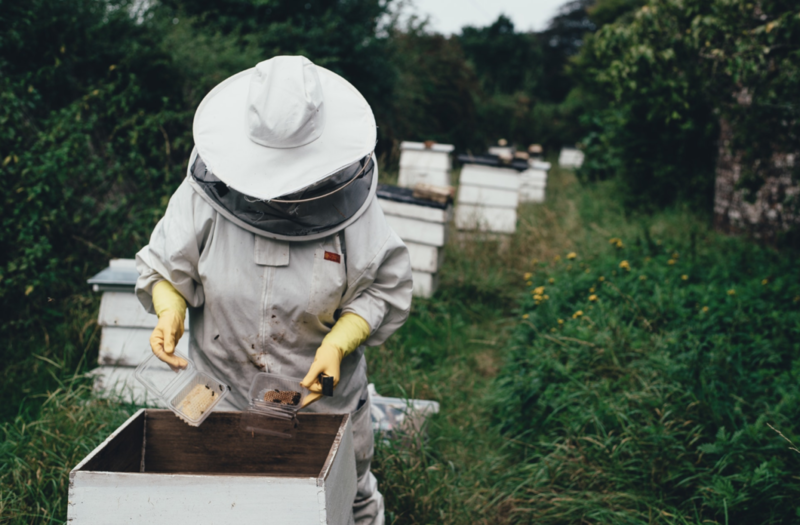 Worker bees must keep the hive neat and tidy so that the queen and larvae remain healthy and thrive. Guard bees are constantly on the lookout for any threats and woe betide the visitor who dares disrupt the harmony of their kingdom. Whether a janitor or one charged with the protection of others, each of us have been given a special gift to serve. One is not greater than the other. We need to play nice. Nurse bees stay busy tending the next generation’s eggs and, when necessary, they are called upon for the important job of raising the next queen. Theirs is a sacred task and they treat it as such. The nurturing of the next generation cannot be taken for granted. We need give special care and attention the young. Theirs will be to continue the work we started. We need to teach them in the way they should go. We need to encourage them to be better than we have been. The Scouts are not only tasked with searching out the best sources of pollen for the Gatherers, but could be called upon to find a new home when necessary. Communication is their forte. Without their infamous wiggle dance, by which they give other bees detailed directions to the next pollen field, a great deal of time would be wasted and wasting time is not something these efficient creatures care to indulge in. We need to learn to communicate clearly to one another. To communicate our love and our values has never been more important. The diligence of the Gatherer bees, provides the nectar and pollen which is the lifeblood of the hive. Without their dedication to seeking out the best sources of this nectar and pollen, there would be no honey; no propolis, used in medicines for humans; no royal jelly to feed the eggs destined to royalty. We must constantly be seeking good spiritual nourishment for ourselves and to share with others. Garbage in/garbage out does not only apply to computer inputting. Royalty here is no simple lay-back-and-be-waited-on existence. The queen spends her entire life, after her mating flight, laying eggs. She never stops for without her consistent, unwavering labor; there is no hive. Every other bee knows that inherent to their job description is: protect and serve the queen. When we serve in a position of leadership, we must always remember our job description is simple. Serve the community, set an example for others and allow them to do their best. Life in the hive produces the peaceful hum not by its members kicking back and putting their feet up; but by continuous sacrifices. There are no individual bees demanding their rights. Just the steady melody of humble service at work. A wonderful allegory and so necessary thank you Kathie! I have a particular fondness for bees!